Our School Parliament is an important part of our school community. Each year group has a representative so that their ideas can be voiced in meetings. If you would like to know who our current members are please check the School Parliament noticeboard in the corridor. 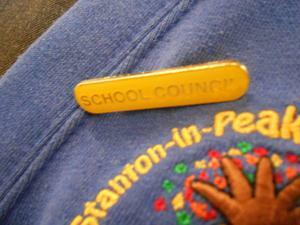 Every member of our School Parliament has a yellow badge, just like the one in the photo. It means that they are easily identifiable in school. All members are asked to wear their badges every day and if they loose their badges they will need to buy another from the school office. School Parliament representatives are voted for by their own year group. Children who are interested have to speak in front of the school, explaining to their year group why they would be a good choice. Some of the older children have prepared power point presentations and created posters to support their election campaigns in the past!